Customize with your photos or design. Design your own personalized cloth tablecloth to protect your table. Give color to your lunches, lunches and dinners with these quality tablecloths, customizable with any photo or design. Material: Panamanian fabric (100% polyester) of 270 grams/square meter. 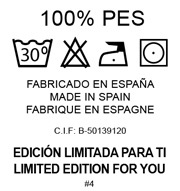 Apto for dryer. Dry at low temperature. All measurements of these textiles are approximate and may be affected by the image transfer process and image preparation. Textile products labelled OEKO-TEX® ensure that all components meet the required control criteria, including accessories such as rivets, buttons, zippers, interlinings, etc. Textile products with the OEKO-TEX® quality seal have properties that are harmless to the skin.